One of the most important aspects of developing an MMORPG is world building. MMO games are crafted to entice us to live in an imaginary, virtual world. Designers and writers create the lore, the founding inhabitants, the very truths that make this fictional planet or universe function. 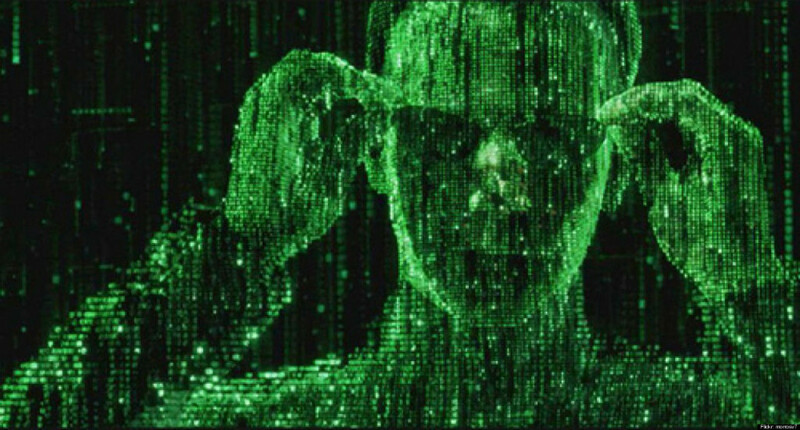 Within these virtual worlds, we are further enticed to do more than simply exist. We are compelled to, and indeed even ask for, methods in which to progress our virtual lives. Where our virtual avatars live and breath, we set them on a path towards achievement. Just as we do with our own lives in the real world. Inhabiting multiple worlds simultaneously presents some challenges. But in achieving goals in the virtual world, we inevitably sacrifice some level of achievement in the real world. This isn’t said to set a tone that MMOs or games of any kind should be avoided. Like appreciating art and indulging in entertainment, games are another outlet in which we can grow, relax, and learn. MMORPGs as a subcategory of games are no exception. However, in contrast to the real world, MMO games offer a compelling package where the real world has trouble competing. So while games offer many positives, it’s all too easy to lose sight of one’s place in the real world. There are a few key reasons why this is the case. And to understand why MMOs can be so addictive at the cost of real world success, we need to examine these reasons. Perhaps the most compelling difference between real and virtual worlds is the rate of achievement. Goals in the real world often require long term planning, execution, and even a bit of luck at times. Some of this is the fault of human nature, where we look too far out and think too big. Two of the more common goals in human life are job promotions and fitness improvements (weight loss, muscle gain, heart health, etc). Both of these are long term endeavors and despite hard work and dedication, they may not be reached due to uncontrollable factors such as a bad boss or injury. One of these two common goals even requires a hefty dose of maintenance. Once a desired weight or fitness level is achieved, the battle then begins to maintain that status quo. Maintenance of achievements is certainly not common in MMORPGs. It’s a lot less time consuming to pickup a bunch of legendaries than to finish college. Within MMORPGs, achievement is rapid and appealing to our “now, now, now!” society more than it would have been to past generations. (Side note – what would George Washington have thought of World of Warcraft?) We measure the rate in which we gain levels, complete quests, acquire loot, build houses, and craft armor in minutes and hours. Not weeks. Not months. Not years. As if to emphasize that fact, many modern MMORPGs employ a set of achievements simply called ‘achievements’ where points are earned for little to no gameplay purposes. When we play in these online worlds it is easy to grow complacent with our real world status with virtual achievements around every corner. Another addictive component of MMORPG achievement that accompanies rapid achievement is guaranteed achievement. Imagine if at work your boss told you that at the completion of your next thirty projects, you would receive a raise. Would you work harder? Could you foresee a few willing late-nighters when you’re on that twenty-ninth or thirtieth project? Knowing that completing a particular set of tasks will lead to certain reward is a powerful motivator. It’s why a number of gamification based productivity apps have sprung up over the past several years. Of course, the major flaw with these apps is that you determine the reward for your work. They can certainly help achieve goals, but your boss isn’t going to care about your level on Habitica (formerly Habit RPG). By comparison, systems in MMORPGs are much more constrained than their real world counterparts. It allows game developers to guarantee results based on completing certain tasks. It’s a significant psychological driver that compels us to play more to gain more. The virtual MMO worlds in which many of us spend hours upon hours do so because the next reward is just around the corner. All one has to do is put in the time and effort and that next level, skill, or weapon can be theirs. We call this the ‘carrot and stick’ approach. It’s no wonder that many gamers get sucked into these worlds not just for entertainment, but to the detriment of their non-virtual lives. Now, both rapid and guaranteed achievement have been discussed before as factors in MMO addiction. However, I feel one area that is noteworthy but undermentioned is that in a given MMORPG, everyone is gunning for roughly the same few things. This is especially true in themepark MMORPGs where the player goals boil down to more loot and more levels, essentially the ability to kill more powerful things. In real life, that would be akin to everyone in the world working as a soldier to improve combat effectiveness. 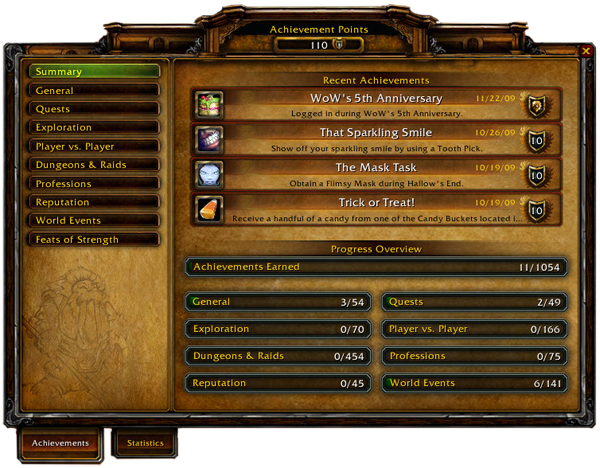 World of Warcraft achieves more achievements! Sandbox MMOs offer a little more variety in goal setting but not by much. The result of crafting or playing the marketplace still typically boils down to power and/or influence. It may not be physical power that every player fights over, but in sandbox titles players are still limited in the scope of long term goal planning. There aren’t any non-profits in MMORPGs dedicated to cleaner water, humane treatment of animals, or the eradication of a disease. There are no comparable life paths in MMORPGs for park rangers, serial monogamists, amateur magicians, and hobbyist woodworkers. So even though sandbox games may offer a more realistic world experience, it’s still not the real world. On the other hand, it does mean that MMORPGs of all types allow someone to focus their efforts much better than perhaps in the real world. Those who have already found their calling in life aside, it’s no wonder MMORPGs can entertain players with days or weeks of playtime. How many of you have ever searched for ‘what should I do with my life’ or ‘what is the meaning of life’? Although this isn’t indicative of actual search queries, Google presents 296 million results for the former question and 371 million results for the latter. Finding purpose is human nature and from almost the moment of entering a given MMORPG, that purpose is clear. It’s another reason we can find ourselves so addicted to our virtual world with complacency or even apathy towards our own. Finally, humans are social creatures. Online virtual worlds allow us to interact with each other in ways that not even other forms of internet communication tools can compete against. Although MMORPGs lose out on intimacy of interactions vs. the real world, the interactions are clearly more accessible. Meeting a new person in a game is less likely to result in a lifelong friend (though it can) because there’s not as much effort required in creating and maintaining the relationship. However, it is a lot easier to meet people as everyone can hide behind anonymity for as long as they wish, and there is an immediate common ground amongst all of the game world’s inhabitants. MMORPGs offer us the ability to stay connected to others with less effort and a lower fear of rejection. It’s yet another reason they can become so addictive at the cost of real world endeavors. I love MMORPGs, and I do struggle at times with bouts of addiction. This is especially true for recently released titles. I think the best method for staying grounded is to first understand these reasons. Once we understand them, we can apply what makes them compelling to our everyday lives. Angela Duckworth, late blooming psychologist, offers tips with that same mentality. If you ever find yourself in a spiral of addiction, consider what it is that’s driving said addiction. I believe the combination of setting shorter term goals, focusing on challenges directly under your control, understanding activities from which intrinsic satisfaction is derived, and regular social interaction in a comfortable manner are all tangential takeaways from MMO to improve one’s first life. And in doing that we might find even more enjoyment in our second life. This entry was posted in General MMOs, Life Lessons, MMO Opinions and tagged addiction on April 4, 2016 by The Bro.